The 21st Annual Westerner Days Fair & Exposition Red Deer Motors North American Pony Chuckwagon Championships Tarp Auction has been scheduled for Thursday, April 18, 2019, and will be sponsored and hosted again by Cambridge Hotel & Conference Centre, formerly the Sheraton Red Deer Hotel in the Special Events Centre. Auction Procedure - “Bidders Choice” successful bidders will have their choice of a wagon or chariot. Advertising on chuckwagon tarp shall be for the five ( 5 ) days of Westerner Days, July 18 - 22, 2018. Chariot sponsorship will be for three (3) days of Westerner Days, July 20 - 22, 2018. Full payment (plus GST) is due the night of the Auction. Payment will only be accepted by credit card or by cheque; payable to Westerner Park. In the event of non-payment, the Purchaser will be responsible for any loss or costs suffered by Westerner Park and/or the driver to find an alternate sponsor. The costs associated with creating a wagon tarp or signage for chariots are not included with the purchase price. The Purchaser shall be responsible for the additional cost for the creation of their tarp or chariot signage. Driver contact information will be provided so sponsors can contact their driver for sizing recommendations. Sponsor advertising and sign work shall be restricted to the wagon tarp or the chariot basket. No corporate signage, messages, or graphics will be permitted on the wagon box or running gear. There may be only one primary advertiser, corporation or otherwise, per wagon tarp or chariot. Holding companies may feature only one “wholly owned” corporate name or logo. Only the primary advertiser will be listed on the race sheets distributed nightly during the races. Any utilization of associated supplier’s names, logos, slogans or tag lines must be restricted to a simple message. For example: “ Authorized ____________ supplier for Central Alberta” or “Your Red Deer agent for _________”. Sponsorship will remain registered to the company whose name appears on the sponsorship agreement with Westerner Park, and is not transferable without prior authorization by Westerner Park Management. Westerner Park does not guarantee that a chuckwagon will perform for five (5) consecutive days or a chariot for three (3) days. a. Representatives from Westerner Park and APCCA must agree on rainout conditions. b. In accordance with the Westerner Park Pony Chuckwagon regulations, if a driver is unable to compete due to illness or injury, a replacement driver will be substituted, pending approval by Westerner Park’s Pony Chuckwagon Committee. 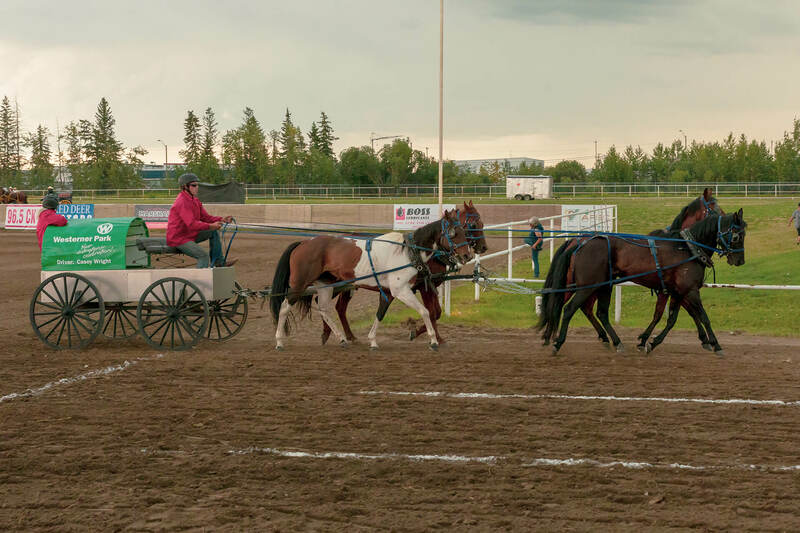 The Alberta Professional Chuckwagon & Chariot Association (APCCA) will be back for the Westerner Days Fair & Exposition as the sanctioning organization for the Red Deer Motors North American Pony Chuckwagon Championships for 2019. The APCCA is no stranger to the sport of chuckwagon and chariot racing as the organization has been entertaining crowds since 1968. There will be many familiar faces and there will be some new faces, but all drivers share one thing in common – they are passionate about promoting this family oriented sport. We look forward to some exciting battles to the finish line during their 51st season of “Racing across the prairies." Information on the organization can be found at Alberta Professional Chuckwagon & Chariot Association. Sponsors will have the opportunity to bid on 40 chuckwagon tarps available for purchase to display their business name and logo for five days of exciting wagon racing and we will also be featuring 6 heats of chariot racing and there will be 24 chariot sponsorships available for purchase. The chariots will run prior to the wagons on Friday, Saturday and Sunday only. All successful bidders at the Tarp Auction will qualify for the door prize draws which include a pressure washer donated by Pumps and Pressure Inc and a “ticket package of 2 tickets each for the Tuesday, Wednesday and Thursday performances during CFR 46 donated by CFR Red Deer. The Red Deer Motors North American Pony Chuckwagon Championships, scheduled for July 17 – 21, 2019, are an integral component of the Westerner Days Fair & Exposition which attracts close to 100,000 visitors to our community from across Western Canada and 43% of these visitors are from outside the Red Deer area. We invite you to consider the benefits associated with joining our Westerner Park community as one of the 40 tarp sponsors or one of the 24 chariot sponsors. It’s a creative way to maximize your organization’s visibility and ensure your message is getting to the right people. We are confident that businesses, like yours, will recognize the value of participating as a sponsor to ensure you are top of mind with local patrons and visitors to our city. In an effort to alleviate time constraints with the registration process, we are asking all tarp sponsors to preregister which will allow us to have bid packages ready for pick up at the Tarp Auction and eliminate the time consuming process of having to provide contact information at the registration desk. Please go to Westerner Park for online bidder registration, driver lists and 2017 placing information and sponsorship benefit details. Payment in full is required on April 18, 2019. Visa, MasterCard, Debit or Company Cheque will be accepted. All Bidders registered prior to April 12, 2019 will be entered into a draw for two (2) weekly admit pins and one (1) weekly parking pass for Westerner Days Fair & Exposition. Also any previous tarp sponsor who brings a new sponsor to the Tarp Auction, and if both sponsors successfully purchase tarps, the previous tarp sponsor will be provided with the opportunity to display a 4 x 8 banner in the chuckwagon bowl for the duration of the races. Banner must be provided to Westerner Park by July 12, 2019. HITCH YOURSELF TO A WINNING TEAM! We look forward to seeing you on April 18, 2019 at the Tarp Auction and celebrating with you at the 2019 Westerner Days Fair & Exposition and the Red Deer Motors North American Pony Chuckwagon Championships from July 17 – 21, 2019! Feel free to share this information with any new potential sponsors.